Living in the digital age that we do, it is no surprise that technology is spiraling into all areas of our lives. I for one rely on my smart phone for more than I would like to admit, and technology is just part of my everyday existence. It is no surprise that technology is now even entering our children’s lives in many different shapes and forms. As a child the most techy bit of equipment I owned was a original Gameboy, which at the time was a coveted toy at the top end of everyone’s Christmas List’s. But flash-forward 15 years and things have moved forward, rapidly. There are kid’s tablets, new kid’s game consoles, PlayStation’s, smart phones that each come with their own set of unique content. Our children are living in a highly digital age, and I don’t think that it is all bad, what I do think we have to be careful with is how much exposure we allow them to be subjected to. There has to be a happy medium. I read a very interesting survey that was conducted over 2,000 parents that explored the different behaviours of our youth, and provided a accurate view of the here and now. It demonstrated the purpose and function that technology is playing today in our children’s lives. One of the points that really stood out to me was that ‘a massive 39% of respondents said that there child owned a tablet, 38% own a mobile phone and nearly a quarter (24%) already have Facebook.’ That last point is quite worrying, Facebook is not a place for children, and I know that when Leo is old enough to discuss social media, there will be a firm age in my mind as to when he can join, and it won’t be until he is at least in high school! What really shocked me was the statistics based on Leo’s age range ‘Nearly 1 in 3 children aged 2-4 own their own tablet (30%) and… Wait for it.. 22% own a MOBILE PHONE! 12% of these 2-4 year Old’s already have their very own Facebook profile. Feel free to chime in with WHAT!? 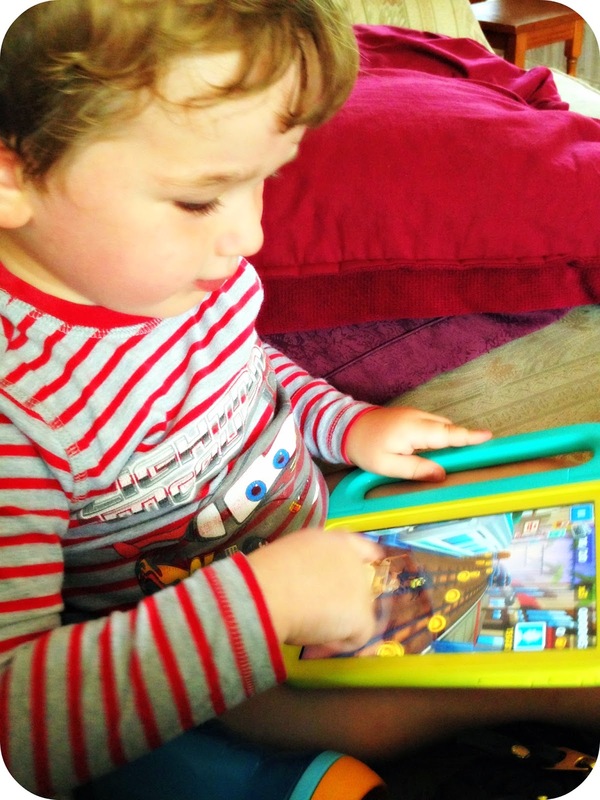 Whenever you like..
Now admittedly for Leo’s 3rd birthday back in June we did treat him to a kid’s tablet, I thought it would be something he could enjoy on car journeys and for those moments where he just needed a quiet half hour. I believe that if the time is governed responsibly and Leo respects this then it will be more of a treat than an item he will sit glued to all day long. As long as a mediated balance is in place, then I think it can be an educational tool. However, I have complete control over absolutely everything on that tablet, from the content, to what he views and to what he can do. Leo’s tablet is completely locked down and I am confident that he is safe while he is using it. Of course Leo does not and will not own a mobile phone until he is old enough and responsible enough to do so, and that of course is many, many moons away. It is suffice to say that I was astounded that children Leo’s age and younger, own their very own mobile phone and their very own Facebook account. All I can wonder is… Why? The results have been compiled into a blog post which includes the expert opinion of Dr Rob Hogan, offering insight into the effects of our kid’s digital habits and how we can use digital responsibly. What are your views on today’s technology and its effect on children?